Personalize the information you want to receive. Subscribe to receive emails with new article posts in the category of your interest, or follow the RSS feeds of your choice. The Office of Communications publishes two newsletters for our diverse internal and external audiences. 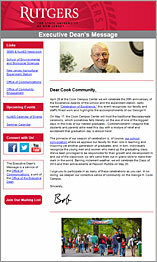 Sign up to receive the Executive Dean’s Message from Bob Goodman or a weekly digest of Newsroom items. 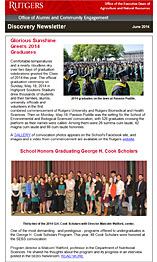 The Office of Alumni and Community Engagement also publishes the Discovery Newsletter for alumni and friends of SEBS. Sign up for their mailing list for news and information about upcoming events. 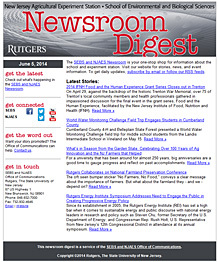 Various departments in the School of Environmental and Biological Sciences and units of the Rutgers New Jersey Agricultural Experiment Station also publish newsletters for their communities. Visit the newsletter pages for the school and experiment station to find topics of interest to you. Climate Change and Agriculture in the Garden State: Anthony Broccoli, professor in the Department of Environmental Sciences, and Brad Hillman, director of NJAES talk about how climate change is impacting New Jersey agriculture and how New Jersey farmers are adapting.